CM Magazine:Reality Rules: A Guide to Nonfiction Reading Interests. (Genreflecting Advisory Series). Reality Rules: A Guide to Teen Nonfiction Reading Interests. (Genreflecting Advisory Series). Westport, CT: Libraries Unlimited, 2008. When I encounter a retrospective selection tool that is published in the United States, I must confess that I usually assume that it will likely have little, if any, Canadian content, and that, while the selection tool, itself, may be useful, I'm going to have to find some way to locate the complementary Canadian books. However, Reality Rules, with its most generous portion of Canadian authored/published books, absolutely contradicted my preconception. Undoubtedly, the fact that the book's author, Elizabeth Betsy Fraser, is a Canadian librarian who works in the Calgary Public Library system, contributed to the work's most inclusive contents. Reality Rules fills a most important gap. Too often, the term recreational reading is equated with just reading books and, in turn, with those books only being fiction. Nonfiction books, often equated with information books, are unfortunately too often excluded from consideration as fare for recreational reading. However, reading interest studies consistently reveal that nonfiction plays a significant role in what males select for their free reading. Reading Fraser's four-page Introduction is an essential starting point. There, she clearly sets out the volume's purpose and scope as well as the criteria used in selecting the items for inclusion. As well, she clearly explains how the book is organized and the parts of each entry. Speaking to purpose, Fraser, says: This guide is intended to help provide young adult librarians with a wide range of choices from which to answer readers' advisory questions. As to the work's scope, Fraser explains: The genres included in this book are those chosen most often by teens for recreational reading. She adds that adult books of interest to teens have been included, and that, in the main, the books included have been published since 2000 although acclaimed titles with older publication dates that are still popular with teen readers have also been included. She also explains that the book's contents are a representative sampling rather than a comprehensive list of all nonfiction titles for teens. In addition to the nonfiction books's contents being assessed according to the five criteria of authority, organization, style, design and illustrations, each book7apos;s popularity with teens was also considered. The contents of Reality Rules are divided into three major sections: Part 1, Nonfiction Genres, which includes two chapters, True Adventure and True Crime; Part 2, Life Stories, also consisting of two chapters, Memoirs and Autobiographies, and Biography, and Part 3, Nonfiction Subject Interests. This last segment is the longest and contains seven chapters: History; Science, Math, and the Environment; Sports; All About You; How To; The Arts; and Understanding and Changing the World. Each chapter begins with a definition of the nonfiction area, a statement of its appeal to adolescents, and then an explanation of how the particular chapter is organized. For example, the contents of Chapter 7-Sports are subdivided into four subdivisions: Biographies, Rules and Tips, The Greatest Games, and Sports in Action. Each chapter concludes with Consider Starting with… and Fiction Read-Alikes. According to Fraser, the former lists titles from the chapter that are popular and highly accessible books. They represent a great starting point for people who would like more information about a certain genre. The latter section, Fiction Read-Alikes, is a terrific inclusion as it suggests a number of novels whose contents can be connected to the chapter's nonfiction focus. For readers, especially boys, whose reading diet might be entirely nonfiction, the bridge books in this section may suggest that fiction actually has something to offer them. Within each subgenre, entries are arranged alphabetically by subtitle. Books in a series that have been written by various authors are entered under the name of the series. Entries include the book's author, title, publisher, publication date, and 10 digit ISBN. Symbols are used to indicate each book's suggested reading level. A most unfortunate typo occurred on p. xi which provides the key to reading levels. M should read grades 6-8 , not ages 6-8, and J should indicate grades 7-9. Additional symbols include one to indicate that the book has won an award, and others suggest possible audiences, i.e. : books that both teens and adults will enjoy; aimed at male readers, ie. boys; suitable for reluctant readers, suitable for use with book groups/clubs; plus core titles that have stood the test of time. Getting a picture of a society through its occupational choices is a novel presentation. Laurie Coulter tackles this challenge for the nineteenth century, taking into consideration the vast changes wrought by the Industrial Revolution and presenting a time line of what is happening in America. Readers are given a novel look at the country in her Cowboys and Coffin Makers: One Hundred 19th-Century Jobs You Might Have Feared or Fancied. Reality Rules concludes with two appendices, Nonfiction Readers' Advisor Resources for YA Librarians and Bibliography plus an author/title index and a subject index. In summary, Reality Rules is a superbly compiled reference work/selection tool that should be owned by all public library systems and school divisions in Canada. 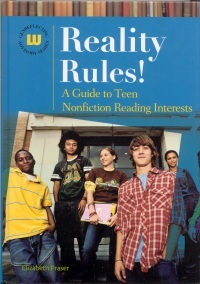 Additionally, librarians-in-training, whether school or public, could use the contents of Reality Rules as an engaging introduction to the wide range of nonfiction that responds to teens' recreational reading interests.